Operators have experience in operating their own plant, but they have limited exposure to other similar facilities around the world. At AmoniaKnowHow.com we try to overcome this by bringing the expertise of independent process and mechanical engineers in our safety studies. An independent process engineer may have a wider knowledge about incidents in ammonia plants which is still quite limited by his own professional experience and cases that he heard about. Industries like aviation and oil and gas overcome this limitation by tapping into Global Knowledge. Fertilizer industry is just heading to this direction. 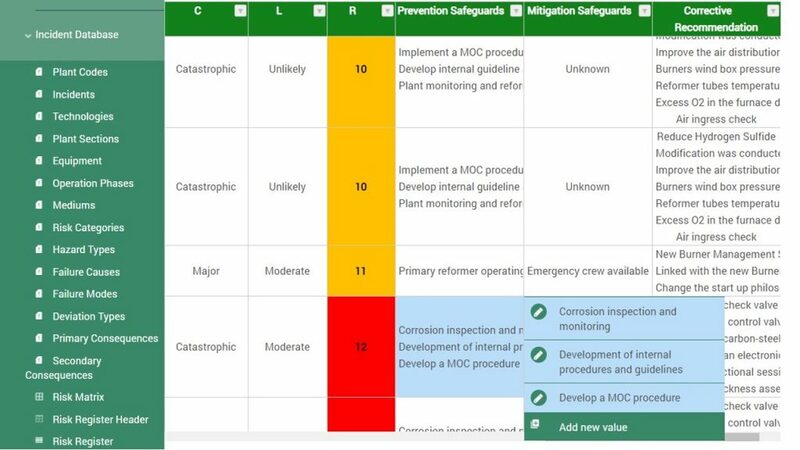 Addressing the needs of our projects and being inspired by other industries we have developed a Process safety global database accessible to operators worldwide. FIORDA is a database that stores incidents from various fertilizer plants around the world. It covers near misses, equipment failures, reliability issues, accidental plant trips, human errors, etc. FIORDA’s main purpose is to collect and exchange process safety data among the participating companies. FIORDA acts as Platform for co-ordination and management of process safety data collection within the fertilizer industry. We structure FIORDA in a way convenient for operators. Sub-main equipment. We are looking to maintain the parent – child relation similar with CMMS system. Operation phase. We notice that many incidents happen during start-up and transient condition, and these are very hard to anticipate in a HAZOP study. And sometimes the human error can occur in very unexpected ways! Early Warning signs! We pay a significant attention to Warning Signs. Consequences: We split Consequences in two categories: Primary and Secondary. Primary Consequence is focused on HSE, fatalities and injuries. Secondary Consequence is focused on loss of production and costs associated with repairs. Based on the consequences we can risk rank each event to determine the level of criticality. We embed a 5×5 Risk Matrix into our system. We can also document Prevention and Mitigation safeguards as well as Corrective recommendations. For each of these we can attach technical documentation, vendors brochures, links to external websites and other sources of information. By a single click of mouse operators can produce a summary report that contains all previously mentioned information. All information from FIORDA is de-identified and any correlation with technology licensor, equipment tag number, plant name, plant location is removed. What are the benefits of such database? Easily accessible to all plants FIORDA is a cloud base platform and can be accessed globally. Risk assessment and evaluation meaning comparing the experience from different operators such as frequency of an incident or severity of the consequences. Technical Queries support FIORDA members can submit Technical Queries to us and we will provide either an answer or a methodology how to solve that issue. Lessons Learned for operators – FIORDA is a well structured library for operators. If we refer to Predictive Maintenance, the Warning Signs presented earlier can act as Detection of Potential Failure giving the operators a better understanding of potential incidents and consequences that may occur. On a Performance curve any signs of abnormality (unusual spots, noise, vibration, parameter deviation, overheating, etc) can be a precursor of a potential failure. We are looking to document as much as possible of this information. In terms of process safety, FIORDA information can be used from projects early stages. The well structured data can enhance the quality of PHA analysis and safety studies, improving the safety outcome in general. Our purpose is to limit the “gut feeling” and increase the quality of our assumptions. A strong argument when building your own Safety Case or Security Report for Environmental Authorities. But how does FIORDA work as a platform? AmmoniaKnowHow and UreaKnowHow independent site experience. This information is available in many of the departments of your organization and will need to be accessed by your team members. plant location … may all be removed before sharing. Accuracy: The value in a particular field is correct. More output and higher plant availability via reduced down time. The idea behind FIORDA was born 4 years ago during a HAZOP study in Brisbane, Australia. We start working on software development in the last 3 years as a combined team of process and mechanical engineers and a team of IT specialists. FIORDA database was presented for the first time at AICHE Ammonia Safety Symposium in 2018 in Toronto.